Come one, come all! Experience the magic and wonder of the Golden Ticket Toy Shop! Take a tour of where the best toys in the world are made! It takes hours, weeks, even years to create some of these amazing toys. You can see the quality and care from the warm hands of our master craftsmen to your child's heart. There is definitely not a Titanic Toy Machine in the back. Then how do we make our toys so quickly, you ask? LOVE! 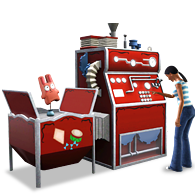 The Saavy Seller's Collection makes The Golden Ticket Toy Shop a great way for Sims to own their own toy store! This special venue comes built with the exclusive business premium objects from The Sims 3™ Midnight Hollow!